Roberto Martinez looks to be in serious trouble, with Everton chiefs set to hold a board meeting this Friday to discuss his future, as reported by the Liverpool Echo. Everton have massively underperformed for the second season in a row, with Martinez’s side currently in 11th place, just ten points above the relegation zone. They’ve had one of the leakiest defences in the league this season, and with Romelu Lukaku not always firing on all cylinders that’s been a real problem. At times they’ve been rescued by the Belgian’s goals, but when he’s not scoring they really struggle. Roberto Martinez has always played a very attack-minded brand of football, which understandably leads to conceding goals. But when your forwards aren’t scoring you just can’t afford to defend like that. Everton bosses have apparently drawn up a shortlist of managers they’d like to replace the struggling Spaniard (via the Metro), with the likes of Manuel Pellegrini, Ronald Koeman, and Mark Hughes tipped to take over. We know Pellegrini will be job hunting at the end of the season, with Pep Guardiola set to take over at Manchester City. The other two have been performing well at Stoke and Southampton though, so may not be too keen to join up with an underperforming Everton side. 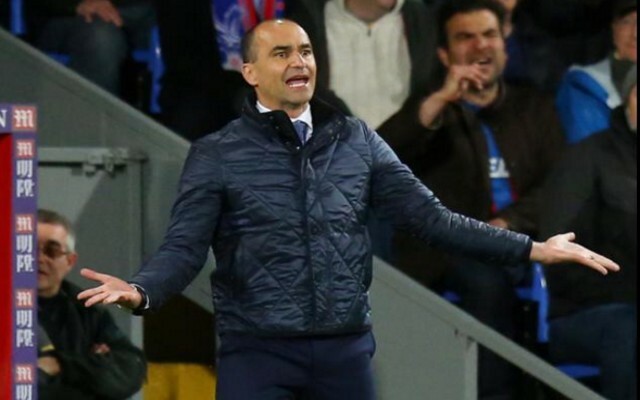 Things really came to a head for Martinez after they were dumped out of the FA Cup at the hands of Manchester United, and their poor form has the fans furious with the former Wigan boss. He looked to be exactly what Everton needed when he first joined the club, with his first season on Merseyside a booming success. Since then things have gone really down hill though, and having gone from a team on the verge of breaking into the top four to a team struggling to reach mediocrity in mid table, it’s hardly surprising that Martinez is being questioned.